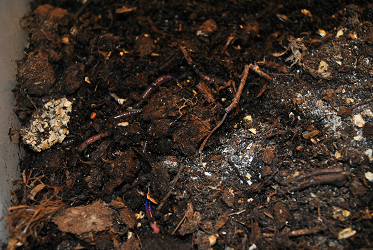 Vermiculture is the raising of worms for use in composting, for bait, and the use of their castings for fertilizer. The castings can be used to make worm tea, or just added directly to your plants as an organic fertilizer. The most common worm that is purchased from a worm farm or supplier is the red wigglers or Lumbricus rubella. These little guys are great for fishing and do wonders for the soil. These worms live just under the surface, ingesting soil along with organic matter and leaving tunnels that carry oxygen to the plant roots and improve drainage. This activity breaks up heavy dirt clods, and the castings keep the soil loose. The key to having worms is to have a place that keeps them happy and comfortable and to feed them. You can build a worm bin or purchase one. I started with having a compost pile outside. This is where I put the grass clippings, leaves, and kitchen scraps to be made into fertilizer. You can use any wood or plastic container for housing your worms. The key is to have one that breathes well. Wood boxes tend to allow a constant supply of air, but plastic will work fine as long as holes are drilled for drainage and you stir in air every few days. 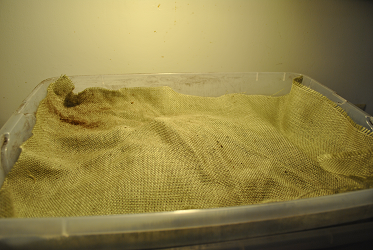 You can use a storage bin and lid, but I would recommend that you not use the lid but instead place burlap on the top. This will diffuse the light, help keep moisture in, and allow a good supply of air. If your worm bin is outdoors, keep it in a protected area, out of the hot summer sun or cold rains in the winter. I turn the compost pile and worm bin every week so the decomposing of new additions to the pile or bin is enhanced. There has never been a smell from the compost pile. When I turn the compost, I see all sorts of worms. This is the same compost pile I used to repot my jalapeno plants. 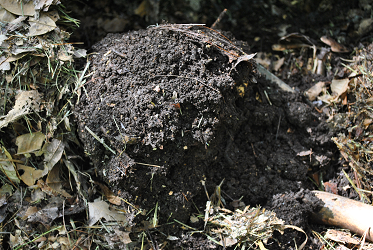 The compost is a rich black soil, not like any other soil in my yard. I have an indoor worm bin that I keep in the basement. 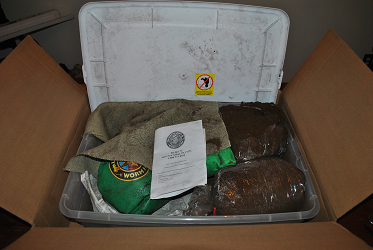 I put coffee grounds and vegetables in that bin. It is just about time to remove castings from this bin. I use the bedding that came with the worm farm. If you want to make your own bedding, newspaper and corrugated cardboard that is shredded into ¼” to 1” strips, works well. Place the strips in water then drain well. You want them to be moist but not soggy. As the bedding disappears, replace it with new. 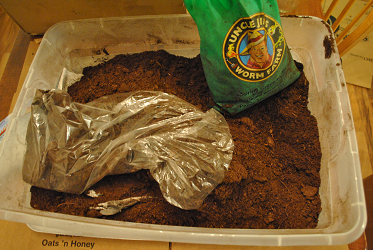 This is the process the worms go through in composting or vermicomposting. Add a few handfuls of moist soil to the bedding. This will help provide worms with the grit that they need for digesting their food. 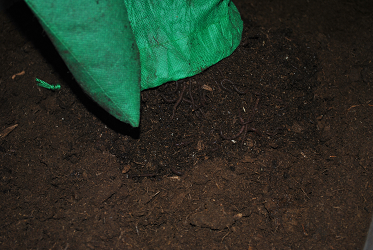 Now that you have your worms taking care of your organic waste material you can start reaping the rewards of the worm castings. After about 6-12 months you will have enough castings to harvest in one of the following methods. Feed the worms in one end of the bin for several weeks, attracting all of the population to one area; then scoop out the castings from the other end. Stop adding scraps until all are eaten and only bedding remains. Remove paper bedding and empty the bin onto a plastic covered table outdoors or under a bright light. Make a long, low mound and slowly brush the castings off the top of the mound. The worms will quickly bury themselves at the bottom. Continue removing castings until the worms are left with a thin covering, then put them back into their bin with fresh bedding. You can place a handful of casting in potting soil for your houseplants or around your vegetables and ornamental plants. There will be worm eggs and a few young worms in the castings, but they will survive and enrich the soil. If your population of worms has exploded, you can begin another bin with half the worms or put some out into your garden. 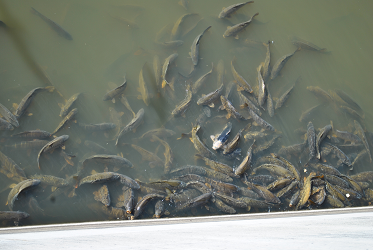 Remember the other part to having worms, is you always have bait when you want to go fishing. Few things work better than live wiggly worms to catch fish with. Having a worm farm is a win-win. They don’t bark, they stay to themselves, your kitchen scraps and grass clipping do not go to the dump, and you will not have an excuse to not go fishing. Your worm box must be well-ventilated. Aerobic bacteria will slowly decompose the organic material, making it more palatable to the worms. If the environment becomes anaerobic (without air) the bin will develop a foul odor and the worms will eventually die. 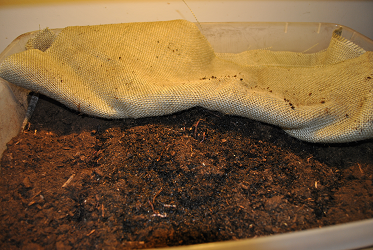 Drain the bedding well before putting it in your worm box. It must be able to absorb moisture from the food scraps you add. The bedding is perfectly moist if it clumps together when you squeeze it in your hand and not water drips out. Usually, it is unnecessary to add water to keep the bedding moist, but if it dries out, add a small amount of water at a time. Until the worms adjust to their new environment, it is a good idea to expose them to light overnight. After a week, they will be well-fed and acclimated to their new surroundings. 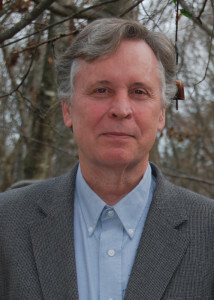 McCreary, Rosemary. “Worm Bin Care.” Worm Bin Care (n.d.): n. pag. Sonoma County Waste Management Agency. E University of California Cooperative Extension Master Gardener Home Composting Education Program. Web.